Blastomycosis is an infection caused by inhaling microscopic particles (spores) produced by the fungus Blastomyces dermatitidis. Blastomycosis may be limited to the lungs or also involve the skin and bones. In its most severe form, the infection can spread throughout the body and involve many organ systems (systemic). Blastomycosis is a fungal infection caused by Blastomyces dermatitidis. Although primarily an airborne disease, farmers and gardeners may become infected from contact with spores in the soil through cuts and scrapes. The fungus that causes the disease is found in moist soil and wood in the southeastern United States, the Mississippi River valley, southern Canada, and Central America. Blastomycosis is also called Gilchrist's disease, Chicago disease, or North American blastomycosis. Another South and Central American disease, paracoccidioidomycosis, is sometimes called South American blastomycosis, but despite the similar name, this disease is substantially different from North American blastomycosis. Canine blastomycosis, a common dog disease, is caused by the same fungus that infects humans. However, people do not get this disease from their dogs except only very rarely through dog bites. Blastomycosis is a rare disease infecting only about 4 in every 100,000 people. It is at least six times more common in men than in women and tends to more often infect children and individuals in the 30-50 year old age group. People who have diabetes mellitus or who are taking drugs that suppress the immune system (immunocompromised) are more likely to develop blastomycosis. Although people with AIDS can get blastomycosis because of their weakened immune system, blastomycosis has not been one of the more common fungal infections associated with AIDS. Once inhaled, the spores of B. dermatitidis can lodge in the lungs and cause a localized inflammation. This is known as primary pulmonary blastomycosis. The disease does not spread from one person to another. In the early stages, symptoms may include a dry cough, fever, heavy sweating, fatigue, and a general feeling of ill health. In approximately 25% of blastomycosis cases, only the lungs are affected. As the disease progresses, small lesions form in the lungs causing the air sacs deep within the lungs (alveoli) to break down and form small cavities. In another 35%, the disease involves both the lungs and the skin. Bumps develop on the skin, gradually becoming small, white, crusted blisters filled with pus. The blisters break open, creating abscesses that do not heal. 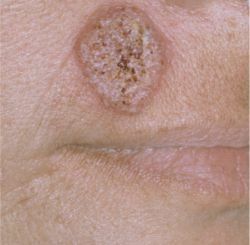 Approximately 19% of infected people have skin sores without infection in the lungs. The remaining approximately 20% of the infected population has blastomycosis that has spread or disseminated to other systems of the body. Symptoms may include pain and lesions on one or more bones, the male genitalia, and/or parts of the central nervous system. The liver, spleen, lymph nodes, heart, adrenal glands, and digestive system may also be infected. A positive diagnosis of blastomycosis is made when the fungus B. dermatitidis is identified by direct microscopic examination of body fluids such as sputum and prostate fluid or in tissue samples (biopsies) from the lung or skin. Another way to diagnose blastomycosis is to culture and isolate the fungus from a sample of sputum. Chest x rays are used to assess lung damage, but alone cannot lead to a definitive diagnosis of blastomycosis because any damage caused by other diseases, such as by pneumonia or tuberculosis, may appear look on the x ray. Because its symptoms vary widely, blastomycosis is often misdiagnosed. Abscess — An area of inflamed and injured body tissue that fills with pus. Acidophilus — The bacteria called Lactobacillus acidophilus that is usually found in yogurt. Alveoli — Small air pockets in the lungs that increase the surface area for oxygen absorption. Bifidobacteria — A group of bacteria normally present in the intestine. Commercial supplements containing these bacteria are available. Biopsy — The removal of a tissue sample for diagnostic purposes. Immunocompromised — A state in which the immune system is suppressed or not functioning properly. Spores — The small, thick-walled reproductive structures of fungi. Sputum — Mucus and other matter coughed up from airways. Systemic — Not localized to a single area of the body but, instead, involving one or more body systems. Blastomycosis must be treated or it will gradually lead to death. Treatment with the fungicidal drug ketoconazole (Nizoral) taken orally is effective in about 75% of patients. Amphotericin B (Fungizone) given intravenously is also very effective, but it has more toxic side effects than ketoconazole. Treatment with amphotericin B usually requires hospitalization, and the patient may also receive other drugs to minimize the its side effects. Alternative treatment for fungal infections focuses on creating an internal environment where the fungus cannot survive. This is accomplished by eating a diet low in dairy products, sugars, including honey and fruit juice, and foods like beer that contain yeast. This is complemented by a diet consisting, in large part, of uncooked and unprocessed foods. Supplements of vitamins C, E, A-plus, and B complex may also be useful. Lactobacillus acidophilus and Bifidobacterium will replenish the good bacteria in the intestines. Some antifungal herbs, like garlic (Allium sativum), can be consumed in relatively large doses and for an extended period of time in order to increase effectiveness. A variety of antifungal herbs, such as myrrh (Commiphora molmol), tea tree oil (Melaleuca spp. ), citrus seed extract, pau d'arco tea (Tabebuia impetiginosa), and garlic may also be applied directly to the infected skin. Left untreated, blastomycosis gradually leads to death. When treated, however, patients begin to improve within one week and, with intensive treatment, may be cured within several weeks. The highest rate of recovery is among patients who only have skin lesions. People with the disseminated form of the disease are least likely to be cured and and most likely to suffer a relapse. Because the fungus that causes blastomycosis is airborne and microscopic, the only form of prevention is to avoid visiting areas where it is found in the soil. For many people this is impractical. Since the disease is rare, people who maintain general good health do not need to worry much about infection. "Blastomycosis." Vanderbilt University Medical Center. 〈http://www.mc.vanterbilt.edu/peds/pid/infect/blastomy.html〉. 1. infection with any yeastlike organism. 2. an infection usually acquired through the pulmonary route, caused by Blastomyces dermatitidis. There may be suppurating tumors in the skin (cutaneous b.) or lesions in the lungs, bones, subcutaneous tissues, liver, spleen, and kidneys (systemic b.). It runs a fulminant, sometimes fatal, course in immunocompromised patients. Called also North American blastomycosis. North American blastomycosis blastomycosis (def. 2). 1. any infection caused by a yeastlike organism. 2. a chronic infection due to Blastomyces dermatitidis, predominately involving the skin, lungs, and bones. North American blastomycosis blastomycosis (2). An infection caused by the fungus Blastomyces dermatitidis and characterized by multiple inflammatory lesions of the skin, mucous membranes, or internal organs. an infectious disease caused by a yeastlike fungus, Blastomyces dermatitidis. It usually affects only the skin but may cause acute pneumonitis or disseminated disease and invade the lungs, kidneys, central nervous system, and bones. The disease is most common in river valleys of North America, particularly the southeastern United States, but outbreaks have occurred in Africa and Latin America. Skin infections are almost always a result of hematogeneous seeding from a primary infection and often begin as small papules on the hand, face, neck, or other exposed areas where there has been a cut, bruise, or other injury. The infection may spread gradually and irregularly into surrounding areas. Lung infection is caused by inhalation of airborne conidia. When the lungs are involved, mucous membrane lesions resemble squamous cell carcinoma. The person usually has a cough, dyspnea, chest pain, chills, and a fever with heavy sweating. Diagnosis is made by identification of the disease organism in a culture of specimens from lesions. Treatment usually involves the administration of amphotericin B in pulmonary disease or itraconazole or ketoconazole. Recovery usually begins within the first week of treatment. The mortality rate is approximately 5%. Also called Gilchrist's disease. See also fungus, mycosis, North American blastomycosis. 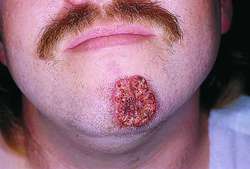 A suppurative granulomatous infection caused by Blastomyces dermatitidis which may disseminate from an inoculation site—cut, bruise or scrape—leaving a central scar, mimicking skin cancer. Immunocompromised patients—e.g., with AIDS—are at increased risk for disseminated blastomycosis. ± 4/100,000 symptomatic, many more asymptomatic. Usually acquired by inhalation, may produce dermatitis, pneumonitis or present as a systemic disease in the skin, lungs, bones, liver, spleen or CNS. Usually begins as a respiratory infection, accompanied by cough, pleuritic chest pain, adult respiratory distress syndrome (ARDS), chills, malaise, anorexia and/or weight loss. Amphotericin B, especially for immunocompromised patients; itraconazole is the drug of choice for nonlife-threatening, non-CNS blastomycosis. A fungus disease caused by Blastomyces dermatitidis affecting the lungs, the lymph nodes at the roots of the lungs, and sometimes the skin, bones and genitourinary system. The disease resembles TUBERCULOSIS. It occurs in North America and Africa. Chronic granulomatous and suppurative disease caused by Blastomyces dermatitidis; originates as a respiratory infection and disseminates, usually with pulmonary, osseous, or cutaneous involvement predominating. B. brasiliensis (South American blastomycosis); characterized by chronic suppurative lesions. The disseminated form is usually fatal. 1. a disseminated or localized infection with Blastomyces spp. 2. infection with any yeastlike organism. an unsightly but innocuous disease of bottlenosed dolphins and humans. Characterized by the presence of red, hard, smooth cutaneous nodules. Caused by infection with a fungus, Loboa loboi. the skin form of North American blastomycosis. North American blastomycosis in which lesions are present in most internal parenchymatous organs. infection by Blastomyces dermatitidis which causes primary granulomatous or pyogranulomatous lesions in the lungs. Secondarily, lesions may occur in the skin, eyes, bone and elsewhere. A disease of dogs, cats and humans. Food animals in the same environment are not reported to be affected. Although the disease was originally recorded in North America and is endemic in some areas of the USA, it is now known to occur in Central and South America. Documenting the prevalence, distribution, seasonality, and disease manifestations of blastomycosis in red foxes in southern Ontario could help elucidate the epidemiology of this regionally emerging disease, delineate geospatial differences in exposure risks, and explore the utility of this wild canid as a sentinel for the risk to public health. Voriconazole has shown in vitro and in vivo activity against blastomycosis. Editorial Note: In the United States, most reported cases of blastomycosis have occurred in the Ohio and Mississippi river valleys and in the southeastern states (2). Thirty-six hours after admission, the forehead lesion showed broad-based budding yeast consistent with blastomycosis (Figure 2), and the patient was given 25 mg of amphotericin B after a 1-mg test dose. These mycoses are largely restricted to North America, with coccidioidomycosis, commonly known as "valley fever" being found in the arid Southwest, and histoplasmosis and blastomycosis occurring primarily in the central United States. Cases of canine blastomycosis are often recognized as sentinels for human disease, presumably because dogs' outdoor exposures are similar to, but potentially more extensive than, those of their human counterparts (6). In northeast Tennessee, 72 patients were diagnosed with blastomycosis from 1980 through 1995; the incidence quadrupled from 1988 through 1995. Endemic fungal diseases should be considered: coccidioidomycosis on the West Coast, histoplasmosis on the East Coast, and blastomycosis in the Southern states. Urine EIA is a noninvasive and sensitive assay with high specificity but is subject to false-positive results in patients with other fungal infections, particularly blastomycosis (6), which is not known to be endemic in Montana or Idaho. 8) In addition to BCG granulomas, a whole array of infectious agents have been reported in the prostate, including other mycobacterial microorganisms, (9) coccidioidomycosis, (10) and blastomycosis, (11) among others. Blastomycosis is a pulmonary disease produced in humans and animals by the thermally dimorphic fungal pathogen Blastomyces dermatitidis.